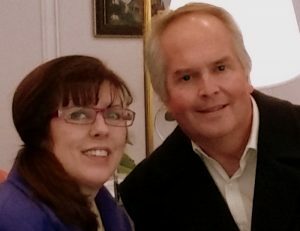 M. K. Scott is the husband and wife writing team behind The Painted Lady Inn Mysteries. Morgan K Wyatt is the general wordsmith, while her husband, Scott, is the grammar hammer and physics specialist. He uses his engineering skills to explain how fast a body falls when pushed over a cliff and various other felonious activities. The Internet and experts in the field provide forensic information, while the recipes and B and B details require a more hands-on approach. Morgan’s daughter, who manages a hotel, provides guest horror stories to fuel the plot lines. The couple’s dog, Chance, is the inspiration behind Jasper, Donna’s dog. Murder Mansion is the first book in The Painted Lady Inn Mysteries. Overall, it is a fun series to create and read. I write to give the voices in my head someone else to talk to. My co-author and myself talk about something for about a week. I throw out suggestions and he uses logic to shoot down the less workable premises. Then I write, he edits and rewrites some parts, we discuss the changes, edit some more, and then send it off to the editor where the process strts all over again. Some of my characters are pushy. They want more of a part in the stories. A few have suggested their own series. They usually get their way because they tend to nag. Write every day. You'll find that helps you manage deadlines and put out books. There are some amazing writers out there that only managed one book in their lifetime. I originally had two publishers. While I was using the traditional method, my husband and I developed our own press for the cozy mysteries. Which worked out well since both publishers went out of business returning my book rights back to me. I would advise new writers to try both methods. When you self publish, stay away from vanity publishers who do not produce good quality books and charge you a ton to do so. It is nice to have a traditional publisher doing the cover and paying for the editing. There not that good about doing the advanced publicity though. That part is usually all you. As an author, I try to cover all the bases including digital and audio books. There has been a swing back to paperback books in the recent years. As a mystery author, I am in the process of making all the books in the series into Large Print too.